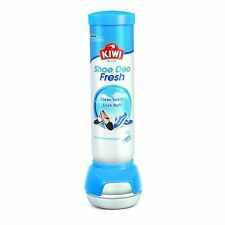 Kiwi Shoe Care & Polish Starter Kit only £19.99!! Kiwi Shoe Care Starter Kit. 1 X Kiwi Polishing Brush. 1 X Kiwi Brown Polish 50ml Tin. 1 X Kiwi Parade Gloss Black Polish 50ml Tin. 1 X Kiwi Shine & Protect Liquid Polish Neutral 75ml. 1 X Kiwi Dark Tan Polish 50ml Tin. The 12 Tin of shoe polish inc KIWI Brantano punch Dubbin & cherry blossom Sport Dubbin. When you buy quality Leather, it's important to take care of it with protection and cleaning. 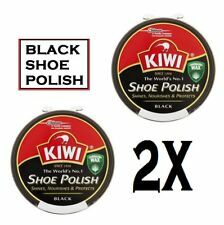 Kiwi Shoe Polish Black 50ml X 12 Tins. Tent Electrics. Military Clothing. Trestle Tables. Sleeping Bags. Camping Toilets. Caravan Awnings. 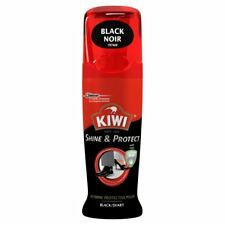 100ml black Kiwi shoe polish. All You Need To Get Your Shoes Gleaming. 2 Wooden shoes brushes. Stainless steel shoe horn with hanging loop. 5 Piece Shoe Shine Kit. Yellow polishing cloth. 5 Piece kit includes. Kiwi Shoe Polish & Boot Care Tin Shiner Nourishes 50ml Mid Tan. It provides a long-lasting shine and increases water resistance. 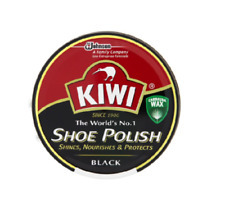 Kiwi is the World's No.1 Shoe Polish. Be sure to add us to your Favourites list. 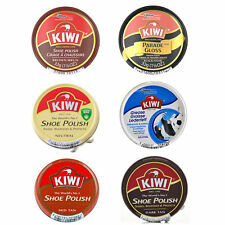 KIWI Shoe Boot Polish Wax Glossy Shines Nourishes Protects # BROWN Color 45 ml. Superior staining and scuff coverage. Ingredients : Paraffin wax, aromatic white spirit. Apply polish with a cloth or dauber. Let dry 1-2 minutes. Brush to bright, lasting shine. For heightened gloss, apply another light coat. 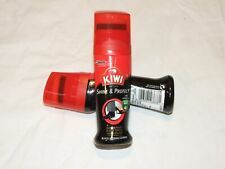 Kiwi Shoe Polish BLACK 50 ML With Pack Of Two Shoe Brush . Kiwi Shoe Polish. SIZE; 50 ML. DIY Shoe Repair Supplies (316). Add to Favorites. Safe & Secure. Zippo Products (3). Signs & Numbers (320). Shoe Care Products (26). Kiwi Shoe Polish. COLOUR ; NATURAL COLOUR. The World's No. 1 Classic Shoe Polish for leather shoes makes shoes look like new for longer. Using recycled materials, not only reduces costs, but saves energy and reduces greenhouse gas emissions which is our contribution to help tackle climate change. Nerf Guns and Accessories. Recycling Ethos. And nourish leather whilst leaving it will a beautiful, long-lasting shine. The unique formula infuses deep into leather to rejuvenate and strengthen, extending the life of black leather shoes. The nourishing polish. Kiwi Neutral Grease Polish For Leather Care 50ml Nourish & Waterproof. and nourish leather whilst leaving it will a beautiful, long-lasting shine. The unique formula infuses deep into leather to rejuvenate and strengthen, extending the life of black leather shoes. 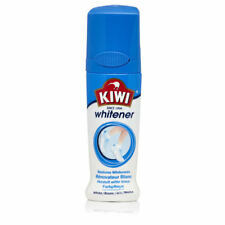 Kiwi Sports Trainer Whitener Sports Leather Canvas Whitener Cleaner 75ml. This whitener is suitable for Canvas, Vinyl and leather shoes and covers evenly without streaks. The bottle has an integrated sponge on top, while using and rubbing the sponge it allows the liquid in the bottle to penetrate through the sponge on to the shoe or boot. 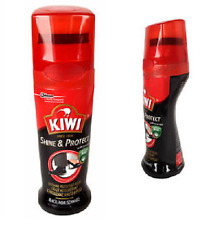 Kiwi Shine And Protect Black Polish 75ml Liquid Boot Shoe Instant Leather Care. Premium Kiwi Product. 75ml liquid shoe polish. and cover scuffs in an instant. A wax rich selfshine formula to nourish and protect leather. Instant BLACK POLISH with Instant shine sponge. We will try our best to fix any problems. The world's no. 1 Shoe polish.